Peru: "The Lutheran Heritage Foundation gives us the tools to instruct!" When we met Raúl, he avidly participated in the weekly “Coffee and Conversation” class, but he made no secret of the fact that he worshiped in different English speaking churches around the city in order to improve his English skills. However, as we got to know him better and became friends, we realized that he yearned for a richer and deeper relationship with our Lord. He repeatedly borrowed English books from our library, and I gave him a copy of Luther’s Small Catechism in English before one of my trips. He worked through that and on my return asked to study more. Finally he and I started meeting at least once a week; he appeared at our house before 7 a.m. and we worked through the Book of Concord in Spanish and English. We talked about the Lutheran understanding that salvation comes only from what God has done for us, and together we studied the scriptures to better understand the gifts we receive in the sacraments. One day my wife, Markie, challenged him, “Raúl, when are you going to realize you are a Lutheran?” He seemed surprised and chuckled, so we changed the subject. But before long he asked me about confirmation and becoming a member of the Lutheran church. 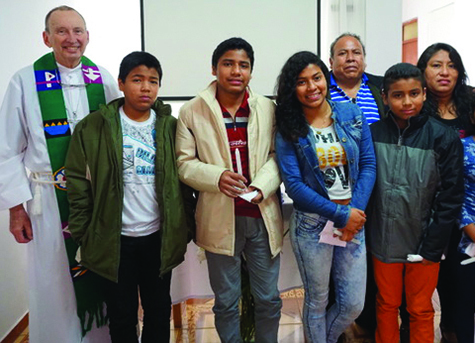 On Easter Sunday, Raúl Rivera became a member of the Lutheran Mission Church here in Perú. He has indicated a desire to serve as a lay leader. Rejoice with us that God has added this man to our Lutheran body! A big challenge is that so many people in Perú have a very shallow biblical experience and knowledge. For many years, the Roman Catholic church forbade reading the scriptures. People obediently shied away from exploring the scriptures. One such man, Ricardo Mueller, actually feared opening the Bible. Today, opening the scriptures to them brings a much deeper understanding of salvation and faith, and forgiveness, and Ricardo and his whole family have been baptized! Now, I look forward to my new call to Belize, in Central America. In Belize, a large percentage of the children speak Spanish in the home, but don’t have Spanish resources. LHF’s translation of A Child’s Garden of Bible Stories will bridge the gap and help us instruct not only them, but place them into the homes of Hispanics who need to hear the word.